1714 – Courier (23/01/1996) ….a brick and tile works was founded in Link Street, Kirkcaldy in 1714. 1825 – 1826 – David Methven & Son, Brick and Tile Maker, The Links, Kirkcaldy. 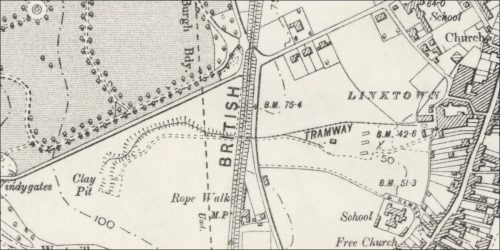 Below – 10/02/1847 – Aberdeen Press and Journal – George Methven, brick and tile manufacturer, Kirkcaldy sues for loss of clay he cannot use from his clay field due to nearby presence of the railway. 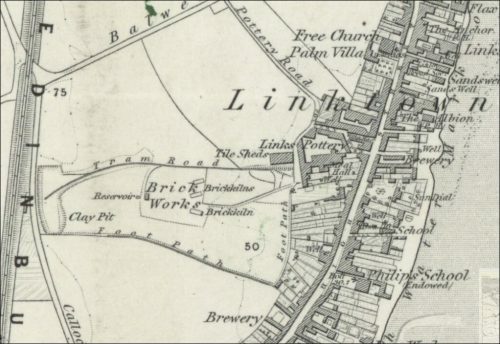 Below – 1855 – Linktown Brickworks, Kirkcaldy – Links Pottery. 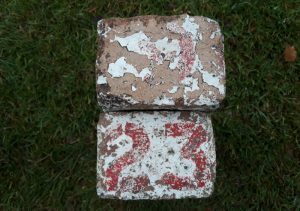 29/02/1856 – Dundee, Perth and Cupar Advertiser – The subscribers have on sale from 2 to 3000 common bricks. Links Tile Work, Kirkaldy. 27/02/1856. 17/08/1861 – Edinburgh Evening Courant – Fatal accident – On Wednesday last, while a man named David Condie was driving two horses with a cart load of tiles from the Links Brick and Tile Work, he met met injuries which resulted in his death on Thursday. It appears that while near one of the railway bridges, in the vicinity of the works, the horses took fright at a passing train and the driver was thrown down, one of the wheels passing over his body. 29/07/1864 – Edinburgh Gazette – The firm of David Methven & Sons, Brick and Tile Makers and Potters, Linktown of Abbotshall, Kirkcaldy, was dissolved on 18th June 1864 by the death, of Mr David Methven, whose Trustees and -Executors have no interest in the Concern now carried on under the same Firm by Mr James Methven, the only other Partner of said Concern. James Methven Trustees and Executors of David Methven. James Methven, Wm Cox, Thomas Cox, H Cox, G A Cox, Witnesses to both Signatures of James Methven, William Smith, Kirkcaldy. James Kilgour, Clerk, Kirkcaldy. Witnesses to the Signatures of William Cox, Thomas Hunter Cox, and George Addison Cox, David Tullo Dow, Witness. David Rollo, Witness. 22/02/1865 – Dundee Courier – Article regarding a burglary at the pay office of the brick and tile works belonging to Messrs David Methven and Sons. A small sum only of cash was taken as the men had just been paid. 1877 – Methven David & Sons (fire bricks, fire-clay, terra cotta, &c.), Kirkcaldy Pottery, Links, Kirkcaldy. 1886 – David Methven & Sons – Fire Brick and Terracotta, Link Street, Kirkcaldy. 1886 – David Methven & Sons, earthenware, brick, tile, fire bricks, sewerage pipes, terra cotta, &c. manufacturers, Kirkcaldy Pottery. 14/08/1897 – Dundee Advertiser – Wanted roof tile maker. Apply David Methven & Sons, Brick and Tile Works, Kirkcaldy. 27/11/1909 – Fifeshire Advertiser – Kirkcaldy workman’s record service – For a period of sixty-three years. Mr Andrew Hunter, Links Street, has been employed by the service of Messrs D. Methven and Sons, Links Pottery. Mr Hunter was born in 1836, and received his education under the renowned late Baillie Paterson. When he had reached the age of ten years, Andrew had the misfortune to lose his father, and consequently he was sent to work at this early age to assist to keep the house ‘going.’ He found employment with Messrs Methven and Sons and was engaged in making bricks. His wages were extremely low, and he only received 1/2d per hour. Work lasted for 10 1/2 hours each day, and his weekly wage amounted to 2s. All the bricks had to be made by hand. Andrew had the assistance of six others, and between them they were able to turn about 4000 bricks per day, the remuneration being 2s 6d per 1000, which had to be divided between the seven hands. Mr hunter is now able to make 2000 bricks per day himself, and is paid at the same rate as seven were paid at in 1846. He can well remember when the present railway was laid between Perth and Edinburgh, and his first journey was to Perth in a third-class carriage, which was exactly similar to the present coal wagons. he used to carry the meals to the navvies who were engaged in laying the rails and cutting the excavations. Mr Hunter is still hale and hearty, and is still engaged with the same firm, being quite capable of doing the full day’s work. He is a well-known authority on wild birds. He is a great believer in fresh air, and after his days toil is over he goes out for his usual constitutional, while on Sunday he often winds his way to Burntisland and back, a distance of ten miles. Mr Hunter has three sons and four daughters alive, and has 19 grandchildren and three great-grandchildren. His eldest son John is also putting up a splendid record, having been employed under Messrs Methven & Sons for 39 years. It is interesting to note that Mr Hunter has never had the attendance of a doctor during the 73 years of his life. 23/02/1918 – Manure for gardens (first class straw stable). 7/6 per 20 cwts at works, 2/6 per load extra delivered 1 mile radius. David Methven & Sons, Links Pottery. Possibly connected as there is reference below to brickworks at Linktown? William Adam bn. 30/10/1689 trained as a mason, possibly with his father. He was a member of the Incorporation of Hammermen of Linktown, Kirkcaldy from at least 1717 to 1734. In 1728 he moved his family to Edinburgh. He had given up even nominal membership of the Linktown incorporation. Clerk of Eldin (Adam’s son-in-law) claimed that Adam introduced the making of pantiles to Scotland after a visit to the Low Countries. In 1714 Adam obtained a license in partnership with William Robertson of Gladney, formerly factor on the Wemyss estate for a tile and brick works at Linktown. Records show that he later supplied bricks and tiles at Donibristle and elsewhere. In 1716 Adam married his partner’s daughter, Mary Robertson. They lived at Gladney House with Mary’s father. Of their children four sons (John, Robert and James who followed in their father’s footsteps and William who had a chequered career in the City) and six daughters (Susannah married John Clerk of Eldin) survived until adulthood. In the 1720s Adam’s practice burgeoned. His emergence as a major player in Scottish architecture may owe something to the collapse of the architectural and contracting partnership of James Smith and Alexander McGilll. Adam was supported by the success of the brick and tile works. He was equipped with a knowledge of construction because of his training as a mason and his knowledge was probably furthered by his trip to the Low Countries. Although Stair was unable to afford a new house, Adam had better luck with Sir John Clerk at Mavisbank, which was a villa and occasional residence of Sir John. It has been observed that Mavisbank with its awkward proportions, banded pilasters and excess of carving is unlike contemporary English villas. Adam’s approach was pragmatic. He drew detail from a range of sources with considerable freedom and inventiveness. He applied whatever style or detailing he chose to each separate commission, drawing both on his Scottish past but also on recent classical architecture from England and the Continent. Despite his friendship with Sir John Clerk, he had little taste for the English neo-Palladian architecture. The work of Gibbs and Vanbrugh were influential but he also used Continental Baroque as a source. Along with the Linktown brickworks and the barley mills, he had, according to Sir John Clerk in 1728 nearly twenty projects in hand: ‘Timber Mills, Coal Works, Salt Pans, Marble Works, Highways, Farms, houses of his own a-building and houses belonging to others not a few’. His enterprises included the ownership of a quarry at South Queensferry, the stone from which could be easily shipped anywhere by sea. Although some of his friends and patrons considered that he might have over-stretched himself, he accumulated considerable wealth. He invested this in house property in Edinburgh and in acquiring the estate of Blair Crambeth in Kinross-shire which he purchased in 1731 for £8010 Scots and renamed it Blair Adam.